The New York Islanders tickets are easy and safe to buy online. Ticket prices start at $25 and seeing an ice hockey match is a true New York experience. 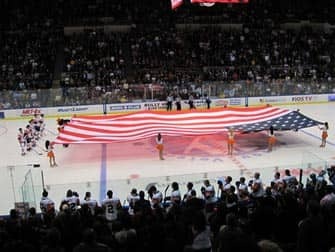 The New York Islanders play both at Barclays Center in Brooklyn and at Nassau Veterans Memorial Coliseum in Uniondale. Hockey season runs from October to April. Attending a hockey game is a memorable experience for anyone. It doesn’t matter if you are a hockey fan or not, you will still have a good time. The atmosphere is always incredible as the audience cheers on the team. The arenas are indoors so this is a great choice when the weather is not good. If you are not able to get tickets to an Islanders game, check whether the Rangers (their biggest rival) or the Devils are playing. Buy New York Knicks tickets now and pay no service fee and get a free shipping (e-tickets) or choose free local pick-up! Buy tickets to a New York Islanders game by checking the schedule here or view the list below. You can pay by credit card. You receive paper tickets via post and e-tickets are sent to you by email. You can also choose to pick up your tickets in New York from a local pick-up point. This option is free. If you can’t print out your purchased tickets, you can also do that in the local pick-up point. The pick-up point is located centrally, near Times Square. E-tickets will always be delivered the fastest. Local pick-up is the best option for all other types of tickets. I highly recommend these options as you save on shipping costs. Your tickets are 100% guaranteed authentic and always delivered on time. 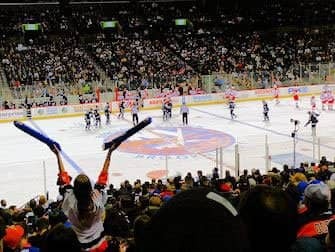 The tickets sold on the site are from New York Islanders season ticket holders who are not able to attend the game themselves. That is why the tickets are offered at discounted prices. 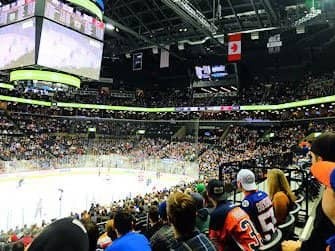 Sometimes the tickets are more expensive than the original price which means that the New York Islanders game was already sold out. What are good seats at a New York Islanders game? Good seats in an ice hockey game are always close to the rink as the puck is small. But don’t forget that you also come to watch live ice hockey and to enjoy the experience. You can see the best seats at Barclays Center marked in the seating chart below. Please note that as Barclays Center was not really built for an ice hockey game, you might have a limited view from sections 207, 209, 223 and 225. If you choose this section, it’ll be cheaper but aim for a low row seat. The lower the row number, the closer you are to the rink. How to get to Barclays Center? It is very easy to get to Barclays Center so don’t worry about the Brooklyn location. Subway is the best way to travel to Barclays Center. You can take subway lines 2, 3, 4, 5, B, D, N, Q and R to Atlantic Avenue – Barclays Center. You’ll exit right in front of the stadium. The journey takes about 22 minutes from Grand Central station. I would suggest to be at the stadium 30 – 60 minutes before the game starts. Take the subway to get back to Manhattan after the game. It is the easiest and fastest way. It’s also safe to travel with the subway back to Manhattan. You will be joined by many Islanders fans. The second home stadium to the Islanders is newly renovated, Nassau Coliseum in Uniondale, Long Island. Are you looking to experience a sports game but don’t want to pay a premium on tickets? And are the Islanders not playing at Barclays Center during your trip? Then a game in Uniondale is a good alternative! To get to Nassau Coliseum, take the Long Island Railroad (train) from Penn Station in Manhattan to Hempstead station. From there, walk to the Hempstead Bus Terminal and take bus N70, N71 or N72, they stop opposite the stadium. You can also take the train to Westbury Station and from here, take a taxi to the stadium. After the game, you can travel the same way back to Manhattan.